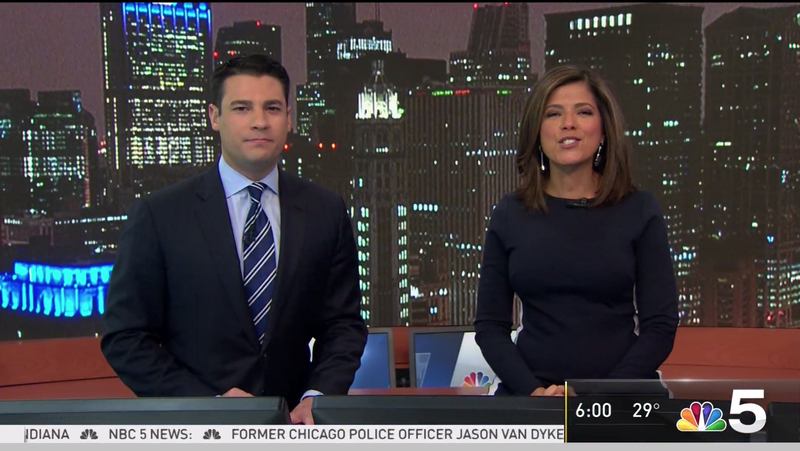 WMAQ, the NBC O&O in Chicago, completed a series of studio updates that resulted in a complete switchover to seamless video walls in three areas of its studio that represent the latest step in the evolution of a set dating back to 2012. The latest string of changes stem back to early 2018, when the station added a new standup area with blue and white walls and a large television screen perched on a console-style unit. The station updated its standup area to this look in early 2018. The previous standup area, which is also used for sports, featured a riser, wood and metallic walls and two video panels — one a touchscreen — built into the wall. Later in 2018, the network updated its standup area’s video panel to a larger, seamless model as shown here. More recently, this cross shot to the weather center shows the smaller, segmented video wall that was first installed in the weather center in 2015. Shortly after that change, the weather center’s workstation was changed to feature video panels on the front. The station then replaced that video wall with a curved seamless model in mid-December. There was a brief period where the cross shot was eliminated, instead cutting right to the forecaster at the chroma key wall, presumably to hide the construction work being done. The new wider video wall eliminated the vertical stack of three smaller television monitors far camera left. Starting Friday, Jan. 18, 2019, the station’s anchors were temporarily relocated to the weather center while work began to replace the video panels behind the main anchor desk. By the following Monday, Jan. 21, the vertically mounted video panels and metal columns behind the main anchor desk were completely removed and replaced with a seamless LED video wall from Neoti. Interestingly, except for the anchor desk and work monitor behind the anchors, the temporary setup at the weather center look relatively similar. The final result was that the weather center, anchor area and standup area all now have similar seamless video walls. The station’s current set draws its roots from a completely new set first installed in February 2012, when the station ditched its studio overlooking the newsroom. The original set features a small 3×3 video wall that displayed stylized cityscapes flanked by backlit walls. However, by September of 2012, the station had removed the entire rear wall and replaced it with five vertically mounted panels with metal columns separating them, mirroring the look its sister station WNBC used at the time, creating the illusion of a large span of windows. Most of the time, the station fed footage, some of it live, of the various city views behind the anchors. This image, taken from 2019, shows one of the final days of the anchor area wall in its previous form and spotlights the tweaks made to the anchor desk over the years, which has retained the same basic footprint and structure. 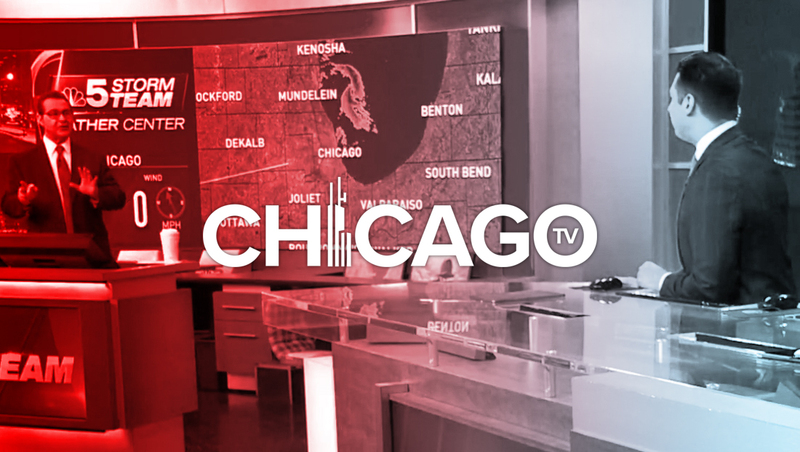 Starting in the summer of 2018, WMAQ began using stylized still images of the Chicago skyline, but reverted back to using video feeds — as it does on the new version of the video wall. 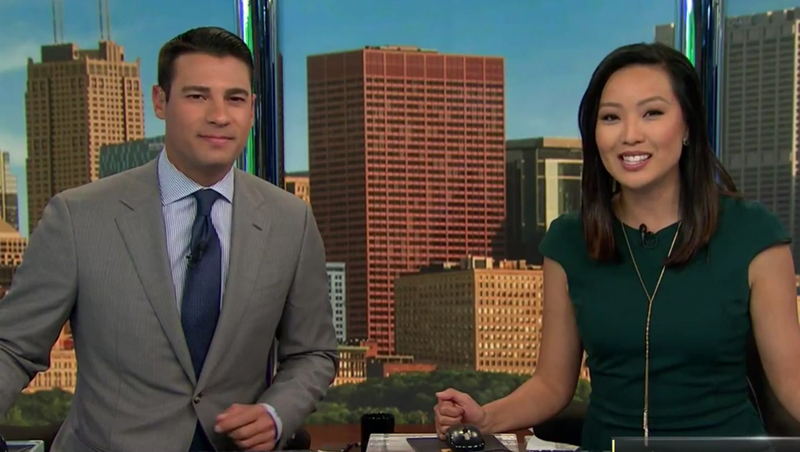 The new look mirrors the seamless background NBC’s O&O in Boston, WBTS, added when the station switched affiliations from Telemundo to NBC in January 2017. Neoti supplied and integrated the new LED display technology for WMAQ. 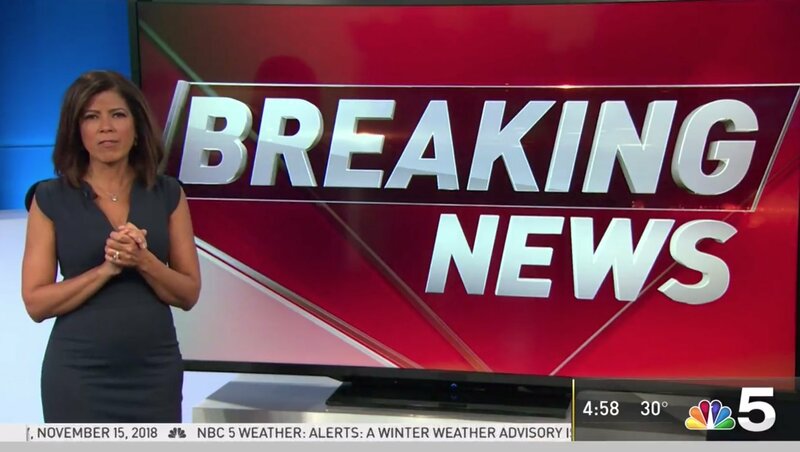 WNBC, which has since stopped using the set that originally inspired the five-vertical panel version at WMAQ, moved to a new set in October 2016 with a similar background, but with slimmed down columns. WLS, the ABC O&O, debuted a new set in September 2015 that features a video wall behind its anchor desk, but the panels feature bezels. In May 2017, WFLD, the Fox O&O in the market, moved to a new set that features a curved bezeled video wall. 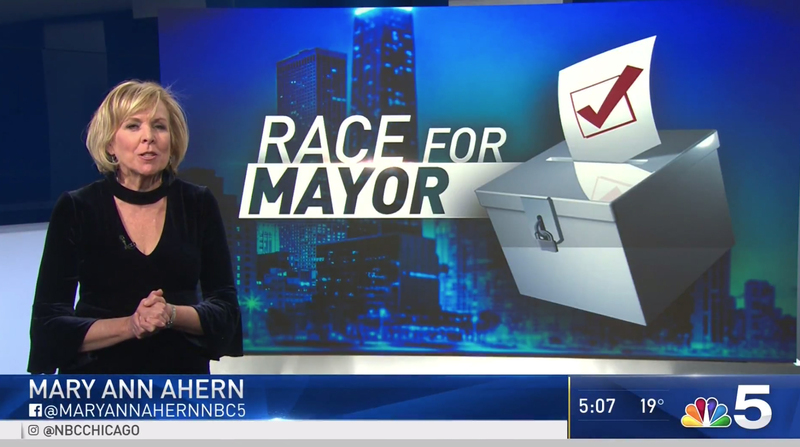 Also in May 2017, the city’s independent station WGN, which produces large blocks of morning, midday and evening newscasts, switched to a new set with a 3×3 bezeled video wall camera center behind the anchors and two seamless, lower resolution panels on either side. WBBM, the CBS O&O in the second city, moved into a new studio in September 2017 that features two bezeled video walls. 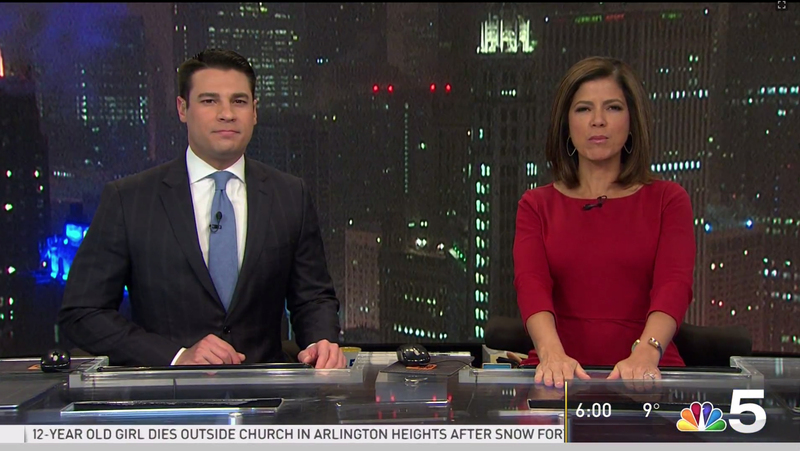 While WMAQ was unique in the market using a vertically mounted video wall behind home base, this update makes it the first station in the Chicago market to use high resolution, seamless LED video walls on its set. By eliminating the metal columns strategically placed to “hide” the seams of the video panels the new look is cleaner and also eliminates the annoying reflections, which often include bright green from the studio’s chroma key wall, that appeared behind the anchors. 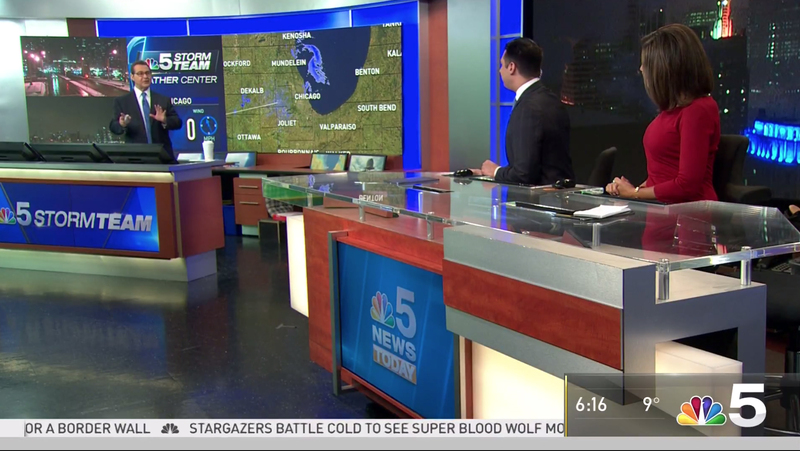 So far the station has continued to use cityscape video feeds behind the anchors which are frequently used on WGN. WLS occasionally uses the approach and WBBM previously did as well.